Steward in the Gallcian Mountains. In the Spanish town of Viana. 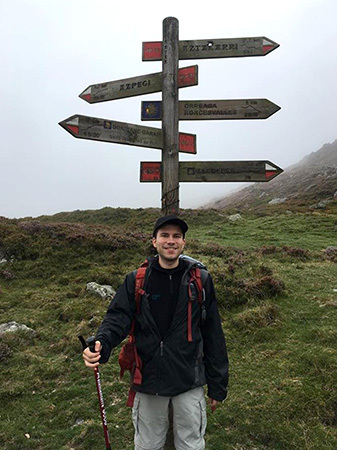 West Windsor, N.J. – Every year, hundreds of thousands of people walk the 500-mile Camino de Santiago trail in Northern Spain from the Pyrenees Mountains to Santiago de Compostela, the Spanish city in which the apostle Saint James is enshrined. This summer, Mercer County Community College (MCCC) alumnus Bryan Steward ‘14 (A.S., Communications) was among them. While the walk is demanding for everyone, Steward has the added challenge of having Becker Muscular Dystrophy (BMD), a form of muscular dystrophy that causes the gradual deterioration of cardiac and skeletal muscles. Prior to the trip, Steward says he did his research. He learned that El Camino was generally deemed less rigorous than many well-known trails. Plus, the spiritual aspect of the pilgrimage appealed to Steward, as did the opportunity to visit Europe. Steward notes that his ultimate decision to do the walk was his desire to live life to the fullest. “Although I am still able to walk and do most of the things I love, I am constantly confronted with staircases I struggle to climb, things I cannot carry, and places I cannot go. Knowing that this condition will most likely put me in a wheelchair one day makes me want to stay active and do all I can do while I am still able,” he explained. 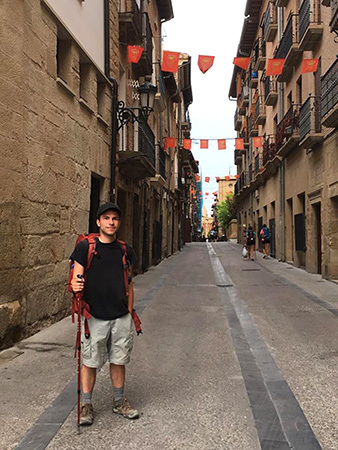 Steward flew to Spain and began his trek on Aug. 18. While he made friends along the way, mostly he hiked alone. He chronicled his adventures on his blog, “Walking 500 Miles While I Still Can,” here, which appears on the Muscular Dystrophy Association’s website. Steward confronted the physical effects of BMD every day of his trip. He experienced knee, hip and foot pain. He fell on uneven terrain. But he says he drew on his mental strength and sheer will to keep moving forward. Climbing mountains proved Steward’s most daunting challenge, especially with the weight he was carrying in his backpack. “It was then that I learned that you don’t have to go it alone,” he recalled. In some of his greatest moments of struggle, other hikers just seemed to appear when Steward needed them. There were the mother and daughter from Norway who helped him down steep portions of trail, and the Finnish girl who happened to be a nurse and was able to bandage his knee when he scraped it in a fall. 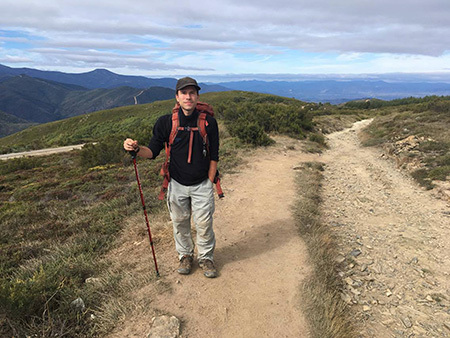 On Oct. 2, Steward finished El Camino 46 days after he began. He returned to MCCC with numerous stories and lessons that he shared with his colleagues in the Division of Lifelong Learning and will speak about with the college community on Nov. 15. Perhaps Steward’s most important lesson was a fundamental change in his approach to BMD. “I am more self-aware. I no longer worry about telling those around me that I have BMD,” he said. Reflecting on his El Camino experience, Steward said that El Camino represents how the world should work. “If everyone just shows compassion and helps each other along their journey, the world would be a better place,” he said. Looking at the arc that has brought Steward back to MCCC as an employee, he is happy to give Mercer some credit for his personal growth. "MCCC gave me a nurturing environment to move forward in my life. I got a lot of guidance and made many good friends. I was involved in Student Government and served as the alumni representative on the Board of Trustees the year after I graduated. All of that helped me be who I am today -- someone who can say they walked El Camino."